This is the improved version of the off-grid system on the previous page. As before, a backup or uninterruptible power supply (UPS) has been used. Dedicated solar inverters are generally better as they tend to be very efficient and have sleep modes. This inverter has the efficiency but not the sleep functions. However, these can be added to the overall system function. The 1U high inverter shown here has an output of 1kW. The system currently has only 300W of PV but there is provision for wind to be added later. As in the original system, the working DC voltage is 48V but with an added 24V bus for the control electronics. As an off-grid system must have no connection to a grid supply, circuits used on a dual supply must be mechanically switched over when off-grid. This can be achieved with a large relay operated by the off-grid supply automatically switching over some household loads when it is available. 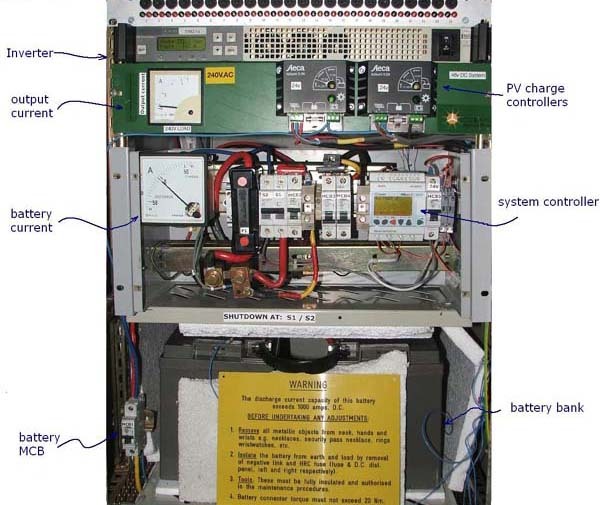 The system controller, used here, is a programmable device that can be setup to monitor the battery condition and the available generating capacity from the PV arrays. It can be programmed to start up the inverter and switch over designated circuits to utilise the available power without compromising the batteries. The battery condition information is currently obtained from one of the PV charge controllers. The controller has been modified so that the information could be read by the plc type controller which starts and stops the inverter. The picture below shows the added ribbon cable and connector. 'Click' on the "Back" icon to return. When the batteries are showing full charge. Any further energy available from the PV arrays is rejected to protect the batteries from over- charging. In this situation the controller will start the inverter and automatically change over certain loads from the mains supply. To further improve efficiency, the inverter DC supply is disconnected via a MOSFET controlled by the plc controller. This puts the inverter effectively into a sleep mode saving standby loads. 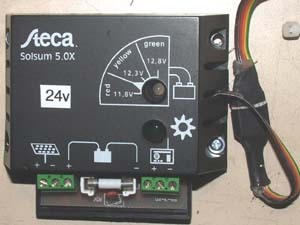 The plc controller disconnects and connects AC loads separately to create soft start/stops on the inverter. This system can also work with the grid- linked inverter. As these cannot work off- grid they shut down in power cuts. In this case it will accept the off-grid inverter's supply as a good mains source and start up. This will only work to a point. If the house loads are not large enough to fully load the grid- linked inverter, the island supply voltage is pushed up. The off-grid inverter will only tolerate a small increase in the voltage. With voltage increases of greater than 5%, the off-grid inverter shuts down with a 'over volt error' and restarts.